perfectly suited to your facility’s needs. Intercall’s Ultra software is the backbone of the Ultra Series. This powerful user-friendly Windows®-based software gives the staff endless options to customize communications. Once the program is set up to meet your needs, changes to the many programmable features can be done in the hectic hospital environment in real time. Ultra is a decentralized system. Each station contains its own control and audio processor which enables it to work independent of a central control unit, gateway or a master station. incorporates all the options of the 6900 series plus additional options such as more external devices inputs, an LCD (Liquid Crystal Display) used to show incoming calls from patient rooms, staff location and features room to room voice communication to 6900 and 9000 Patient, Staff and Staff/Duty stations. The simplicity of the central equipment panel provides ease of installation and services. Patient stations include auxiliary inputs which can be used for patient monitors, bed exit alarms, etc. Connect to independent providers of bed exit devices. CAT6 and conventional cable used for installation. The Ultra system uses a 19 inch touchscreen master with a single Windows based interface utilized by nursing staff and programming technicians. 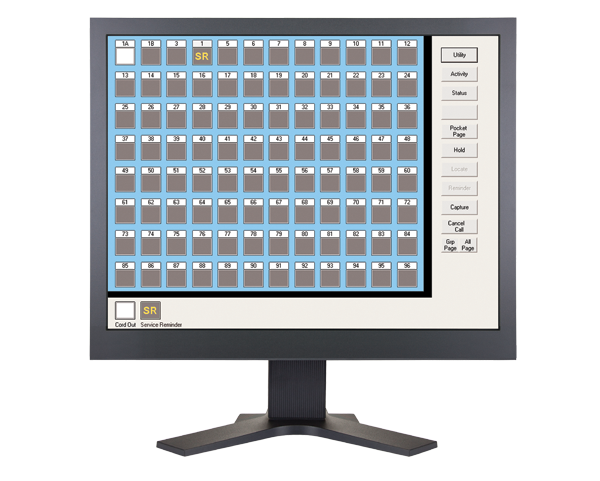 The Touch screen master’s user interface provides a Direct Call screen which can show up to 96 or 144 room icons; an Activity screen which is able to show unlimited, scrollable, call queue; and a Map screen capable of showing a complete floor layout and direct call access. Completely customizable user interface buttons and icons colors and fonts. Selectable call tones and auto adjust of tone volume levels according to time of day. Master to Master audio communication over VoIP. External PC Consoles can be associated with Mini Masters through Ethernet with the ability to see call activity and initiate calls. Custom Duty Zoning according to room numbers and type of calls. Time and date displayed on Master screen automatically synchronized over SNTP server or manual setup. Stations can be assigned to any room and any icon on the touchscreen master. The touchscreen master also includes an automatic station replacement programming feature. Customizable call assignments for dome light color, dome light flashing rates, call tones, call name, etc. 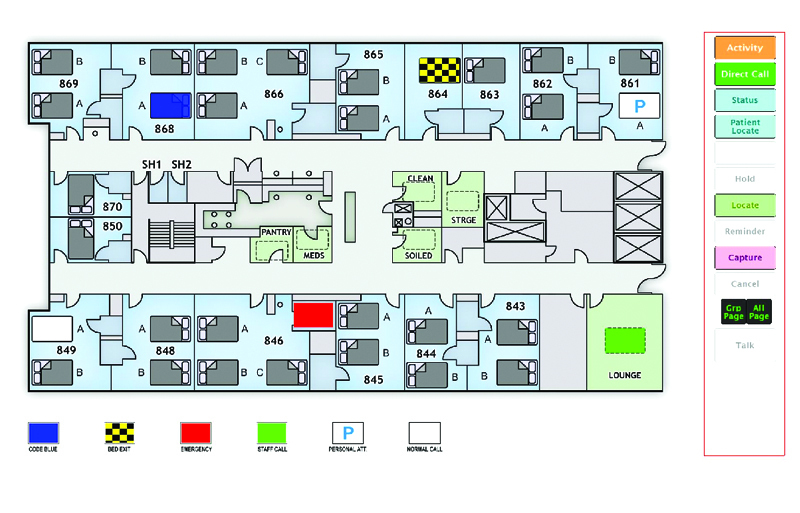 Room capture capabilities for swing room or whole system transfer with auto program of duty stations and zone domes. Staff, Patient and equipment locator with infrared technology. Other technologies are accepted, such as RF. Locators can be assigned to Nurses, Aides, Doctor and Patients. Nurse Room assignment with programmable shifts for Nurse Follower feature with the capability of answering calls with voice communication from patient stations. Staff Emergency through IR Locator Badge. Call overtime notification and call emergency upgrade. Patient stations provide external programmable call inputs with the ability to link calls. Integration with remote code blue panel annunciators. Integration with pocket pager, tablets and wireless phones and providing talk back over VoIP feature. Network infrastructure with HL7 integration with ADT, Smart Bed (status, brake, alarm, etc.) and other systems. History-of-calls reports accessible remotely from any computer connected to the Network. Management information reports with Excel. Programmable zone dome and staff duty assignments by room or type of calls. Programmable room page zones, all page and corridor page. Continuous system status check routines with notifications.